At last the wait is over and the winner of this years Halloween Costume Contest Giveaway has been chosen! I want to thank everyone for taking the time to put together a costume and making a video and of course publishing their Halloween Costume to YouTube so we can all take a look at it. There where many really good costumes that did not make the top 5 so again thanks to everyone for taking part! OK so let's get to the winner. As you know I narrowed the list of video entries down to my top 5 picks and then setup a survey for everyone to have the opportunity to select their favorite video from the top 5. 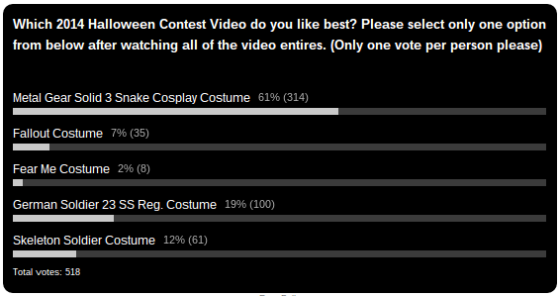 As you see the clear winner was the Metal Gear Solid 3 Snake Cosplay Costume video entered by Devin Dhillon! Congratulations to Devin Dhillon for winning this years Halloween Costume Contest Giveaway! I will be contacting Devin and letting him know what his options are for this years prize.